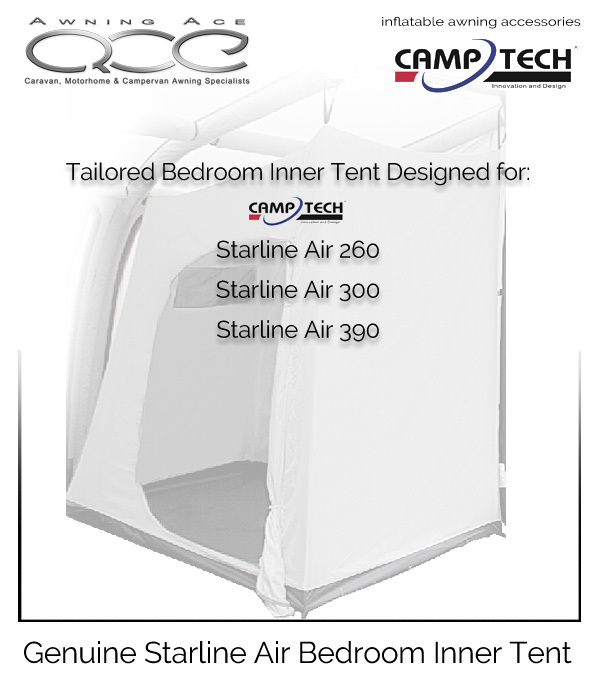 Designed for the 2016 - present-day Camptech Inflatable Awnings; this inner tent adds a secure and comfortable bedroom space within the main living area of your awning. With a large access roll back door, high-level ventilation and internal organiser storage pocket the bedroom inner tent come complete with a fully sewn in groundsheet making it a cosy and comfortable place to sleep at night. The bedroom inner tent hangs quickly and easily within your inflatable awning and can be easily removed and stored when not in use. Make the most of your space and increase your sleeping accommodation.